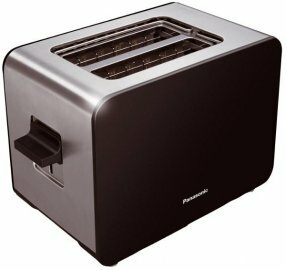 Panasonic NTDP1BXC Unique Design Toaster in Black is the perfect complement to Panasonic’s Breakfast Collection, its robust shape and simple look introducing a new dimension to the 2 slice toaster, offering a real design statement for your kitchen. Seven browning levels, defrost and reheat settings and a bread centering feature give optimum all over browning results for a variety of breads and food types. Ergonomic side handles and stainless buttons allow for easy selection and use. Panasonic NT-DP1BXC is made to last, and is packed with features such as a stainless steel interior and cool touch exterior keeping those little fingers safe and giving peace of mind provide durability and safe use. Panasonic NTDP1BXC looks elegant, without compromising on functionality.